Michigan residents are accustomed to soul-crushing snow. For those in the northern part of the state, a snowmobile’s practically a prerequisite for living and getting around during the wintertime. But using a horse and buggy? For most of us, that’s an unusual look. 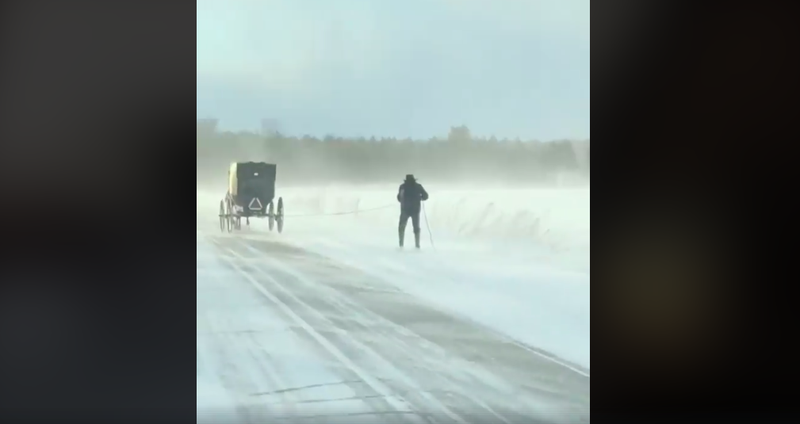 Earlier this week, Tara Hayward left a Christmas party when she spotted a man on skis being pulled down the road by a horse and Amish buggy. Hayward told WOOD TV in western Michigan that she immediately told her husband to slow down so she could catch a glimpse of the sight and—thankfully, for all of us—film it. On Monday Hayward posted the video to Facebook and, as these things go, it’s been spreading like wildfire. What’s funny is, Hayward says it’s not that strange to see in her small town of Morley. I spent the majority of my life living in Michigan, but across the other side of the state. So, honestly, this was new to me, too. We’re just used to shoveling chest-high piles of snow. It’s unclear how long this guy was skiing, but the wind chill kept things around zero degrees for most of the week in Michigan. Hopefully it wasn’t a long trip.